Editor's Note: Below is an excerpt from a recent institutional research note written by Demography analyst Neil Howe. To learn more about accessing our institutional research email sales@hedgeye.com. 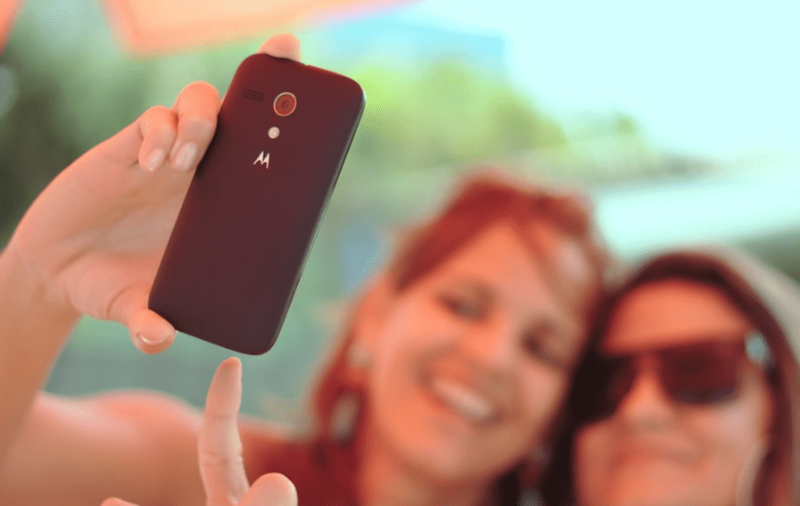 Fully 85% of Millennial workers say life insurance benefits are “somewhat” or “very” important, the largest share of any generation. With many Millennials starting their own families, this naturally risk-averse generation could create resurgent demand for life insurance policies. Neil Howe: As we have often pointed out, rising risk aversion and a willingness to trust employers to trade their pay for "plans" is making Millennials very favorably disposed to just about every type of employee benefit. According to the 2018 Transamerica Retirement Survey, Millennials are the only generation that ranks life insurance almost as desirable as health insurance and a pension plan (ranked one and two by all generations). What's more, it's impossible to find any other benefit that is more sought after by any older generation than Millennials. This is true for financial wellness, workplace wellness, and "employee assistance" programs. More remarkably, it also true for cancer insurance, critical illness plans, and (even) long-term care insurance. Still more evidence of risk aversion: Millennials are the most likely to say they put their retirement savings "mostly into bonds, money market, and cash" (20%, versus 15% for both Xers and Boomers). And they are the least likely to say they put it "mostly into stocks" (19%, versus 26% for Xers). I know... this flies in the face of every principle of optimal life cycle asset allocation. But Millennials report the highest retirement confidence. And they report starting to save much earlier in life than their parents and grandparents--at a median age of 24, versus age 30 for Xers and age 35 for Boomers. Just 18% of Millennials say that America “stands above all other countries in the world,” the smallest share of any generation. This figure exemplifies the decline of American exceptionalism; unlike older adults, Millennials can’t remember a time in their lives when the United States was the world’s unquestioned superpower. NH: Last week we pointed out that this declining belief in American exceptionalism--while often described as a progressive or blue-zone trend--actually fits pretty well with Trump's zero-sum strongman outlook on how America needs to manage its foreign policy. After all, if America is no longer exceptional, it can also no longer afford to waste its precious resources on free-rider globalism. It is sobering to compare these results with Pew's extensive April survey on the state of America's democracy, in which it points out that while Millennials have the most trust in how America's democracy is working (Xers have the least trust), both Millennials and Xers (especially those with less education) are the most likely to believe that "significant changes are needed in the design and structure of American governance." Roughly two-thirds of Millennials and Xers believe this--versus only half of Boomers. 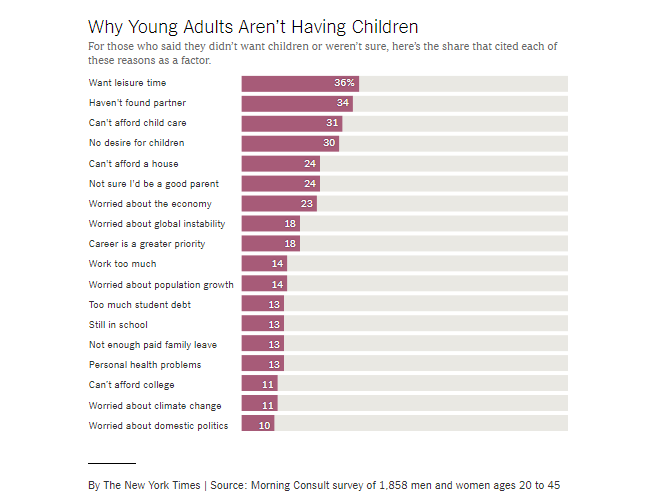 About one-quarter of current/would-be mothers say they expect to have fewer children than they consider ideal. Why? Almost all of the most commonly cited reasons hinge on financial insecurity—from the exorbitant cost of child care to concerns about the economy. 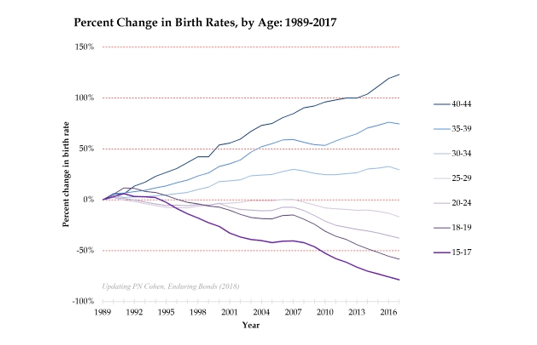 NH: Nearly nine years into the post-GFC recovery, U.S. fertility rates are still sinking--and more than all of this decline is being driven by fertility-rate declines under age 35--that is, by Millennials. The leading causes elicited from young women by this survey all point in different directions (see below). The most popular single response was "want more leisure time." Also right up there: "haven't found a partner," "can't afford child care," and "no desire for children." There is not much attention in this piece to the troubled future economic prospects facing Millennials as a generation, and no attention at all to the plummeting birth rates among very young and immigrant women. Instead, much of the piece focuses on gender workplace issues--and the fact that the male-female earnings divide grows rapidly between age 25 and age 35 as many mothers cut back on employment and hours. But, as Pew Research documents, this is not a new trend: It can be observed in birth cohorts going all the way back to the early 1950s.